Last weekend, in between jobs, homeworks, engagement parties and other life events I was able to make some bread. Those who know me, also know by now how much I find making bread, and in particular kneading, a stress relief. No knead bread might be good for those busy days when I don’t want to mess up the kitchen but when I need to relax I need to knead. And I have to admit that in the past few months my bread making skills have dramatically improved. This time I did not go fancy, however. I wanted a simple bread that went well with soups and creams, which, despite the warmer weather here in the Bay Area, I’m still very much enjoying for dinner. I decided to go for some olive oil small breads. Olive oil bread is among the most common in Italian bakeries but it really bothers me that sometimes bread called olive oil bread does not really taste like olive oil. So I wanted to find out a recipe that gave me some very tasty little breads. These sure were perfect for my weekly soups: a crunchy crust on the outside, and a strong olive oil taste from the inside. Stir the yeast into the water in a large mixing bowl and let stand until foamy (about 10 minutes). Stir in the oil and then the flour and salt until well blended. Transfer the dough onto a flour surface and knead until very elastic (about 10 minutes). First rise: place the dough in a lightly oiled bowl, cover with plastic wrap, and let rise until doubled in bulk (about 2 hours). The dough should be moist and velvety. Shaping and second rise: divide the dough into 6-7 equal pieces each about the size of a lime, and shape them into small balls. Arrange the balls on a parchment-lined baking sheet. Cover with plastic wrap and a towel and let rise until doubled (about 1 ½ hours). You can make a wreath by placing the balls in a circle shape about 1 ½” apart. Preheat the oven to 400F degrees. Bake for 20 minutes if you have left them as individual rolls and for 30-35 minutes if you made a wreath. Your bread looks absolutely gorgeous. I love how crunchy the outside looks but how tender and fluffy the inside is. Wow. Yes, I need some stress relief so I guess I need to knead too. Who needs to buy olive oil bread in the shops when you have wonderful home-made ones like these. They look fantastic and good at any time! The bread looks great! 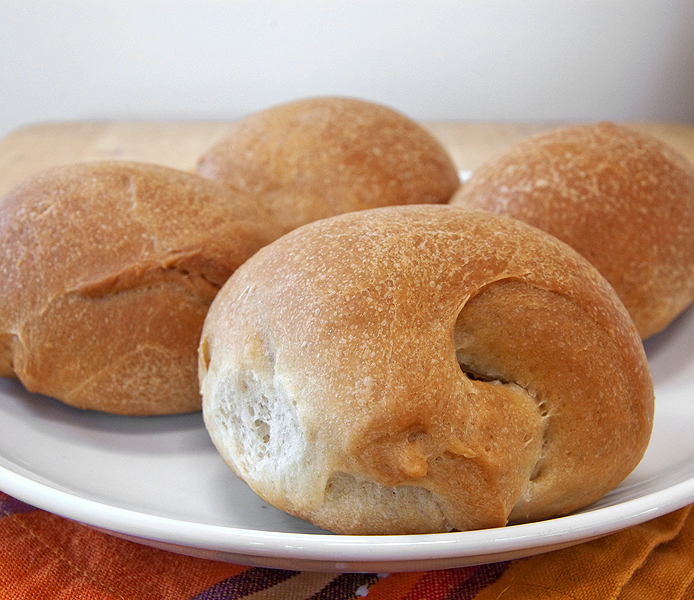 I've always made my rolls with butter, but olive oil sounds like a great substitution! What pretty rolls....love the crust. I don't think I've ever used olive oil to make bread....I may have to try that out. I love dinner rolls... Whenever I go to an italian restaurant I end up full from bread long before my dish even comes to the table. I'm not sure I've ever had olive oil bread before but this looks delicious - i bet heavenly straight out of the oven. Sorry to hear that you have been so busy and stressed lately, I hope things calm down for you soon. I would love to hollow out one of these rolls and actually make it a soup bowl. Would be so good to soak up every last drop. I can smell those over here! It is hard to find ones that really have a good olive oil flavor. Will have to try these. I really don't need an excuse to eat bread. I'm hoping you get some relaxing in this weekend! I love the sound of the olive oil in these rolls. I helped to harvest some of my friends olives and in return she gave me some of the gorgeous first press olive oil. This looks like the perfect way to show off the delicious flavour, thanks!! Oh wow those rolls look so inviting - what a compliment to any meal. I am imagining a bowl of hearty soup with these rolls ... that will definitely get me through this blizzard. I've been wanting to try an olive oil bread recipe, and this one looks like a great one to try:) They look so warm and fluffy, yum! I love making bread and find it to be a great stress reliever too. Your olive oil rolls look gorgeous. I'm always looking for new bread recipes and I'm adding these to my list! :) Thanks for the recipe, can't wait to try them! Perfect soup bread, I think! I confess, I let my kitchenaid mixer do all my kneading! MMM, Sara!! I love this bread. I'm with you, I really like to make bread, just the process I find soothing. Today it's in the bread machine though as I'm short on time, so I'm kneading virtually. I like that this recipe doesn't make a huge volume, we always have leftover, which is nice, but not as nice as fresh. I'm eager to add this one to our repertoire! Nicely done!! You're right - this would be a wonderful bread to dunk into soup. Simple and satisfying. These rolls look terrific! I'm a bread fan as well... and yet I so rarely make it (probably because I know I'll just eat it all). Simple and delish! Wow, these look pretty much amazing and just screaming for a bowl of soup! Great job! These rolls are gorgeous! Perfect for a bowl of minestrone!!!! Gorgeous bread. I've only baked bread a couple of times, but I can completely understand why you find kneading relaxing. It's like transferring stress into the dough until everything becomes more manageable. Yum, I want some now! Gotta to try these ASAP. Thanks for sharing. hope your weekend is going well, best wishes to you and Wally! These rolls look so lovely...perfect with soup or chili! I am absolutely swooning over these rolls! I love how you converted the measurements over for us. I'm definitely going to make these soon when I next make some soup :-) They're absolutely gorgeous and I love the contrast in textures! Lovely rolls, perfect for soup. Kneading bread dough is one of my favourite tasks in the kitchen. 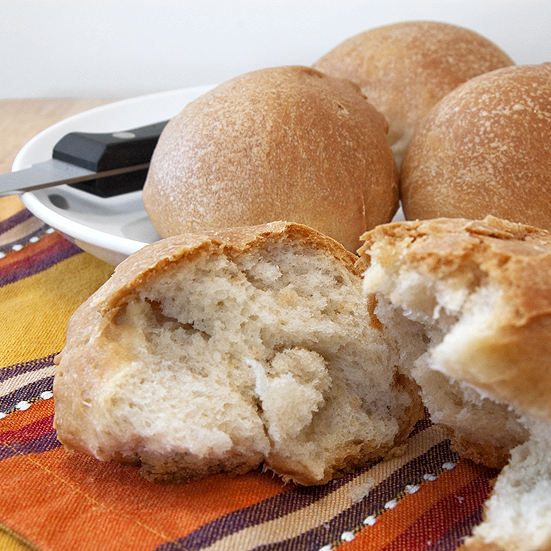 There is nothing more comforting than the smell of homemade bread or rolls baking in the oven. Making more bread is on my to-do list for this year and this looks like a fantastic recipe to get started with my resolution. Absolutely beautiful! have. got. to. try. Ive been kicking yeasts booty this year and I don't want my enthusiasm to slow down. These look amazingly delicious (amazing how bread can do that huh?) and I are being added to my list asap. These rolls look just divine! I love the golden, crisp outside and the fluffy inside. I can just imagine splitting it half while it is hot and putting a pat of creamy butter, letting it melt, then enjoying each bite. I must make these!!! i love home made olive oil rolls, i was thinking of making some this coming weekend. yours look so soft, perfect for dipping in a bowl of soup. thanks for sharing. sorry to hear about your busy days, hope you see the light soon. This is unique. I would have NEVER thought of this. I never heard of olive oil rolls. I REALLY want to try this (I saved this recipe). Keep it up!! I've never seen a recipe for bread using olive oil (other than say pizza crusts and foccacia), so I'm excited to try this out. And hee hee I love that you find kneading bread therapeutic, Sara - because, me too! !